A technology-loving comedian from the future who cares enough about the world to engage with it politically, Baratunde Thurston has over 30 years experience being black. With an ancestry that includes a great-grandfather who taught himself to read, a grandmother who was the first black employee at the U.S. Supreme Court building and a mother who took over radio stations in the name of the black liberation struggle, Baratunde has long been taught to question authority. It helps that he was raised in Washington, D.C. under crackhead Mayor Marion Barry. Forged by his mother’s lessons and polished by a philosophy degree from Harvard, his creative and inquisitive mind has found expression in the pages of Vanity Fair and The UK Independent, on the radio waves of WNYC, and on the screens of news networks such as CNN, MSNBC, BBC and Al Jazeera. He even hosted his own show on Discovery Science called Popular Science’s Future Of. Far from simply appearing in media, Baratunde is also helping define its future. In 2006 he co-founded Jack & Jill Politics, a black political blog whose coverage of the 2008 Democratic National Convention has been archived by the Library Of Congress. For the past four years, he has helped bring one of America’s finest journalistic institutions into the future, serving as Director of Digital for The Onion. In 2011 he was a judge for the Knight News Challenge, a media innovation contest which funds experiments in the future of news. He is currently writing a book titled, How To Be Black, due out in 2012. His most significant expression, however, is probably his own experimentation with new digital platforms. He was named “Foursquare Mayor of the Year” for holding a real-world rally to defend his virtual mayorship. Every year he live hate-tweets the Twilight movies to his 95,000 Twitter followers, and in 2009, he embodied the swine flu with a Twitter account of that name. Mr. Thurston (which he goes by near the end of his bio) also travels the world, speaking and advising on the subjects of our digital future, media and democracy, and race and politics. He has spoken at SXSW, Google I/O, the Online News Association Conference, the Mashable Awards, Web 2.0 Expo, Personal Democracy Forum, Internet Week NY, Social Media Week, TribeCon, the ACLU Annual Dinner (Mass. and Mich.), Surf Summit 14 (Mexico) and Digital Directions (Australia). In May 2011, he spoke at the presidential palace in Tbilisi, Georgia (the country) on the role of satire in a healthy democracy. 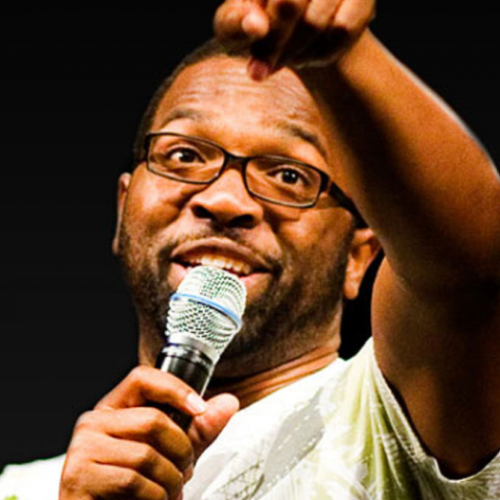 Baratunde performs standup comedy regularly in New York City, resides in Brooklyn and lives on Twitter. And yes, he votes. Regularly.